Look at the cute button that Sarah at Real Life made for me! Save the image to your computer, put it on your blog (or facebook), come back and tell me, and get an early extra entry in the giveaways! I wanted to tell you about all the prizes so you can start drooling now - LOL! 7 of the 8 prizes will be given away Thursday 4/9 thru Monday 4/13 (my b-day!) to random commenters and the 8th prize will have entry instructions ONLY given on Twitter! 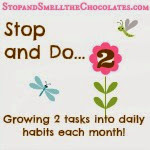 Sign up there now and start following me @stop4chocolate. OK - without further adieu - the prizes! Read carefully as there are a couple of discounts for you too. 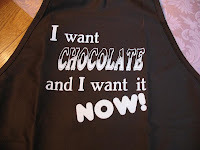 Prize #1: A chocolate-themed apron from Cheryl at An Occasional Chocolate *Won by Kim! Isn't that apron just perfect? You know you need it! An Occasional Chocolate is a cool local company that offers supplies for chocolate candy making. Cheryl even gives you step-by-step instructions. She also blogs at Chocolate Candy Recipes and can be found on twitter as @MakeChocolates. Thanks Cheryl! 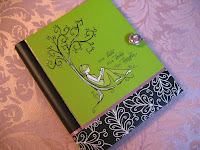 Prize #2: A set of 3 decorated folders from Kristy at Misty Kristy Designs *Won by Muthering Heights! 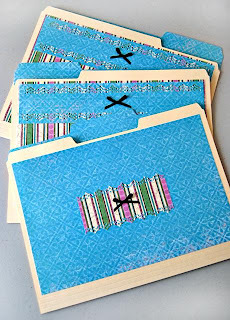 She made these folders special for my giveaway! They are SO cute! Misty Kristy Designs is an Etsy shop with really cute decorative file folders and cards. What a great way to get organized and to get wonderful gifts for friends. Kristy blogs at Misty Kristy Designs and can be found on twitter as @M_K_Designs. Thanks Kristy! Prize #3: 1/2 pound whole bean (or ground if you prefer) Chocolate Raspberry Coffee from Ashley at Javateas *Won by Ginger! Can't you just smell it brewing? Javateas is a coffee cafe located in Pennsylvania. You can enjoy their coffee no matter where you are though - order the whole bean coffee online and have it sent to your door. Ashley blogs at Javateas blog and her personal blog Livin Our Love Song. Thanks Ashley! 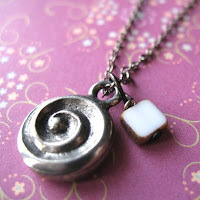 Prize #4: A charm necklace (your choice under $10) from Nicole at RJ Charms *Won by Lori Ann! Just some examples. 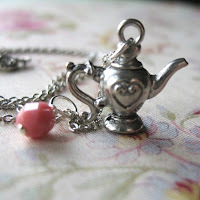 Might have to fight you for a tea necklace! RJ Charms is an Etsy shop selling charm necklaces, bookmarks, charmies and other charm items. They are very affordable and cute creations. Nicole blogs at A Life Designed, by RJ and can be found on twitter as @DsgndbyRJ. Thanks Nicole! 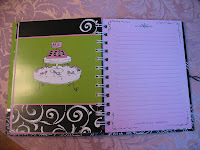 Prize #5: A Sassy & Sophisticated Christian Journal from DaySpring *Won by Charlotte! The Sassy & Sophisticated line is so cute. It reminds me of me - well, the sassy anyway, hey I'm halfway there - LOL! The journal is very high-quality and girly - a lovely gift. It has pages in it with quotes and pictures too. Even if you don't win, you can go get one from DaySpring! You can also find them on twitter as @DaySpringCards. Thanks DaySpring! ~And look for more DaySpring items to be reviewed (and some given away!) during Tea For Two-sdays on my blog! 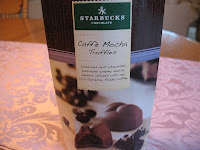 Prize #6: Starbucks Caffe Mocha Truffles from me *Won by Jen T! 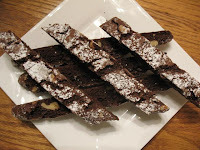 Prize #7: Homemade Biscotti from me *Won by Mary Snyder! 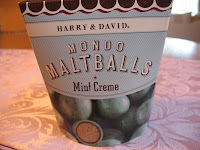 Prize #8: Harry & David Mondo Mint Creme Maltballs from me - *ding, ding, ding* - this is the prize that you'll have to get on twitter for - worth it I say! *Won by @WayMoreHomemade! Yum! The Harry & David lady said, "Think Girl Scout thin mint cookies in a maltball." And she oh so cleverly gave me a sample. She was right and 2 boxes later (plus other items), we walked away. The only reason I am willing to give them up? 'Cause I already had my own box (I did manage to share a few)! Trust me, these are fantastic. You can find them at a Harry & David store or online. Whew, that's a lot of good stuff! Better come back tomorrow! In the meantime, spread the word! To see what's working for other people, stop by Works-For-Me-Wednesday hosted by We Are THAT Family! oh man I want that apron! What a fun week this should be! 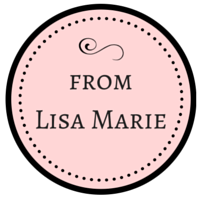 I added a blog post about your blog and included the cute button! What amazing prizes! I can't wait to come back for the party! alright Lisa, I want that journal!!! I'm going after it! Your button is going up RIGHT NOW! Happy blogaversary!!!! I'll try to visit tomorrow. WOW at those prizes! Congrats and I'll try to get that button up. Let's see, I want the coffee, truffles, biscotti and more... ha! Are we sharing choco recipes with you this Friday? Okay I'll tell you what I want right now so you can just take them off the market before tomorrow! LOL. I want the apron, the truffles(because I am that source)and the coffee. See I didn't say everything because that would have been greedy! Right? Right? You know my address so I'll just wait by the mailbox for them to arrive in a few days! Phew I feel better about this already. LOL. Are you laughing at me? Huh? Are you? You know I love you my friend. Big you've got some wonderful prizes and I better win one size hugs to you! LOL!!! You know people are going to think we're weird! It looks like it is going to be a great blogoversary!! Yeah Prizes! 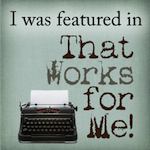 I posted your button on my blog! Finally got your button on my blog. LOL On the left sidebar. LOVE the stripes! I didn't know you did this, Lisa. This is AWESOME! I appreciate all the help you've given me at CCS. You're totally dependable and trustworthy and that is a rare thing indeed.